Unsafe food consumption is a severe problem because of heavy metal contamination, which is caused by director indirect activities of industries. 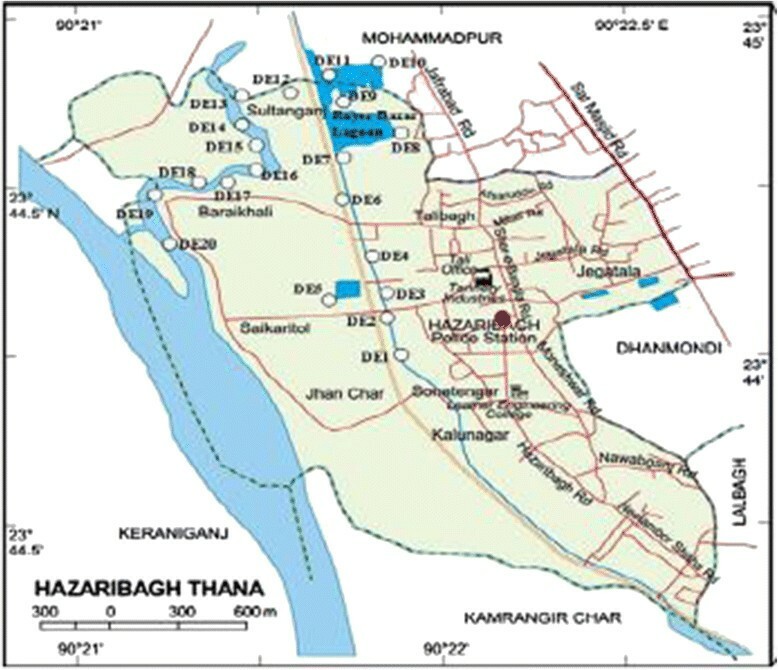 The present study was conducted to assess the risk of human health by Heavy metals (Cu, Co, Fe, Zn and Mn) through the intake of vegetables and fishes obtained from the area adjacent to the Hazaribag tannery campus, Dhaka, Bangladesh. The trend of mean metal concentration in Buriganga river water was Fe >Mn > Zn > Cu > Co and according to Department of Environment, Dhaka Bangladesh (DoE) (1999) the value of the above metals are within the permissible limit of irrigation water except Fe. An assessment of risk involved due to consumption of contaminated food also calculated. The trend of metals in vegetables was Fe > Mn > Zn > Cu > Co and in fishes the trend was Fe > Zn >Mn > Co > Cu. Accumulation of trace elements in vegetables was lower than maximum tolerable levels proposed by FAO/WHO food standard programme (2001) with the exception of Fe and Co respectively. In fishes metal concentration was lower than safe limit set by WHO (1989) except Mn. The Metal Pollution Index (MPI) for all the foodstuffs showed a higher value, however the calculated Health Risk Index (HRI) indicated no risk to human health upon consumption of those foodstuffs. The overall study suggests that foodstuff in the area were contaminated by the assayed metals and long-term consumption can cause potential health risks to consumers. Rapid development, growing populations, as well as increasing urbanization and food demand in Southeast Asia combined with the use of polluted waters for pre-urban food constitute a potential food safety risk. The knowledge of dietary intake of essential and toxic elements in Southeast Asian countries such as Bangladesh is limited. The poisoning effects of heavy metals are due to their interference with normal body biochemistry in normal metabolic process (Okunola et al. ). Heavy metals are classified in two main categories i.e. essential and toxic heavy metals. Essential heavy metals (Cu, Co, Zn, Fe, Ca, Mg, Se, Ni and Mn) are required in very trace quantities for the proper functioning of enzyme systems, hemoglobin formation and vitamin synthesis in human but metabolic disturbances are encountered in case of excess of these essential metals (Hina et al. ). In recent time, the rapid and exponential industrial growth in Bangladesh caused increased production of waste, which witnessed in Hazaribag industrial area located towards southwestern Dhaka. In Hazaribag area, there are about 277 tannery industries, 15 dying, 3 salt industries, 1 pharmaceutical industry, 1 soap factory, 2 match factories and 2 lead-zinc industries. Buriganga River, which is the major sources of water supply for agricultural, livestock and fishing activities (Azom et al. ), is contaminated by the wastes discharged from these industries as it contains a bulk amount of liquid and solid wastes with substantial quantities of heavy metals: Zn, Cu, Co, Fe, Mn, Ca, Ni, Mg, Se etc. The contamination of river allows these pollutants to accumulate in common fish species by biomagnifications, which are used as local food sources (Azom et al. ). Long-term use of wastewater in irrigation affect food quality thus safety (Muchuweti et al. and Sharma et al. ). Plants growing in nearby zone of industrial areas display increased concentration of heavy metals serving in many cases as bio-monitors of pollution loads (Mingorance et al. ). Vegetables cultivated in soil polluted by toxic heavy metals due to industrial activities take up heavy metals and accumulated them in their edible and non-edible parts. Heavy metal pollution is of significant ecological or environmental concern because they are not easily biodegradable or metabolized thus precipitating far-reaching effects on the biological system such as human, animals, plants and other soil biota (Yoon ). Food chain contamination is the major pathway of heavy metal exposure for humans (Khan et al. ). In the present study area there are more than 0.2 million people and 20,000 people are directly exposed to the hazards (Asaduzzaman et al. ) and rest of people are affected by Dietary intake which is the main route of exposure of heavy metals for most people (Tripathi et al. ). Thus, information about heavy metal concentration in food products and their dietary intake is very important for assessing their risk to human health (Zhuang et al. ). The present study aimed to assess the contamination status of trace elements in water, vegetables and fishes of the adjacent area of the Hazaribag and embank of Buriganga River, Dhaka. The concentrations of trace elements in water, vegetables and fishes were compared with the established safe limit and the value of intake metals in human diet was calculated to estimate the risk to human health. The study was carried out in the cluster of tannery industries in the Hazaribagh area of southwestern Dhaka. It lies within longitude 90°22/-90°22/48//E and latitude 23°43/34// 23°43/49// N and located by the side of River Buriganga. Lot of industries suited in Hazaribag and most of them discharge their effluents without any prior treatment in the Buriganga River. Different kinds of vegetables such as Brinjal, Eggplants, Chili, Stem Amaranth, Radish, Spinach etc. are cultivated in the nearby land of these industries throughout the year. Beside, a variety of small fishes also cultured in the Buriganga River throughout the year. A map of the sampling site is shown in Figure 1. Map of the Sapling Site (Hazaribag), showing the sampling point by DE1, DE2….DE20. Water, vegetables viz., Stem Amaranth (Amaranthus lividus), Radish (Raphanus sativus), Spinach (Spinacia oleracea); fishes viz., Tatina (Cirrhinus reba), Spotted snakehead (Channa punctate), MozambiqueTalipia (Oreochromis mossambicus) were randomly collected in triplicate from different location of the study area during the period of February to March 2013. The samples were tagged and carried in the laboratory. For Energy Dispersive X-ray Fluorescence (EDXRF) measurement of elements, the preparation of water samples involved the absorption of a certain amount of the sample on weighed amount of dry analar grade Whatman cellulose powder. A volume of 500 ml of each collected water sample filtered with Whatman 41 filter paper was taken in a clean weighed porcelain dish followed by addition of 4 gm of cellulose powder and evaporated on water bath. The sample after evaporation to dry mass was further dried under IR lamp at about 70°C for two hours to remove the trace of moisture and weighed. For homogeneous mixing, the dry mass was then transferred to a carbide mortar and ground to fine powder using a pestle. The processed sample in a plastic vial with identification mark was preserved inside a desiccator. The plant samples were cut into suitable pieces with a stainless steel knife, washed first with tap water, and rinsed with deionized water three times. The inedible parts of all fish samples were removed with a stainless steel knife. The remaining edible part of the samples were washed with tap water and then rinsed with deionized water three times. All plant and fish samples were then taken on porcelain dishes separately. Each dish with the particular sample was marked by an identification number and placed in an oven at around 70°C for overnight drying which was continued until a constant weight was obtained. The dried mass of each sample was then transferred to a carbide mortar and ground to fine powder using a pestle and preserved in a plastic vial with identification mark inside a desiccator. The Panalytical Epsilon 5 Energy Dispersive X-ray Fluorescence (EDXRF) (model: Epsilon 5, made in Netherland) was used as major analytical technique for carrying out elemental analysis in the samples. For irradiation of the sample with X-ray beam 2 g of each powdered material was pressed into a pellet of 25 mm diameter with a pellet maker (CARVER, model: 3889-4NE1, U.S.A.) and loaded into the X-ray excitation chamber with the help of automatic sample changer system. The irradiation of all real samples was performed by assigning a time-based programme, controlled by a software package provided with the system. The standard materials were also irradiated under similar experimental conditions for construction of the calibration curves for quantitative elemental determination in the respective samples. The generated X-ray spectra of the materials were stored into the computer. The X-ray intensities of the elements in sample spectrum were calculated using the system software by integration of area of the respective X-ray peak areas using peak fitting deconvolution software. A direct comparison method based on EDXRF technique was used for elemental concentration measurement Jolly et al. (). As the analysis is based on direct comparison, the standards of similar matrices were used for the construction of the calibration curve in order to avoid the matrix effect. Three lab-synthesized cellulose-based multi element standards, five plant standards (Apple Leaf/NIST 1516, Spinach/NIST 1570a, Orchard Leaf/NIST 1571, Tomato Leaf/NIST 1573a, Peach Leaf/NIST 1574) and three fish standards (Tuna-1, Tuna-2, Tuna-3) were used for the construction of calibration curves for carrying out elemental analysis in river water, plant and fish samples respectively. The calibration curve for each element was constructed based on the K X-ray and L X-ray intensities calculated for the respective elements present in standard samples. The curves were constructed by plotting the sensitivities of the elements as a function of their atomic number. The validation of calibration curves constructed for elements present in the standards were checked through analysis of standard reference materials (Tuna fish for fish sample and Spinach for vegetable samples). The results obtained for elements of interest and certified values for corresponding elements are shown in the Table 1. All results in respect of certified known values were found to vary within the acceptable range of error. To assess the contamination level of heavy metals, mean, median, minimum, maximum, and standard deviation of water, fish and vegetable samples were performed using Microsoft Excel (version 2007). Where Cfn = concentration of metal in n in the sample. Where, Cmetal, Dfood intake, and Baverage weight represent the heavy metal concentrations in foodstuff (μg g−1), daily intake of foodstuff and average body weight, respectively. According to the food consumption, survey by Alam et al. () and Kennedy et al. (), Bangladeshi people per person per day consumes vegetable: 130 g and fish: 24 g The average body weight (Baverage weight) was taken as 70 kg for adults according to WHO . In contaminated water, the concentration of Fe was found highest (31.091 mg/l) and ranged from 20.683 to 39.313 mg/l which was much higher than the range 4.13 to 5.53 mg/l, reported by Ahmad and Goni () and lowest concentration was found for Co (0.014 mg/l). Copper concentration ranged from 0.025 to 0.081 mg/l, which was lower than the values (0.07-6.30 mg/l) reported by Gupta et al. (). Maximum Zn concentration in Buriganga river water was 0.427 mg/l. Mn concentration was varied from <0.74 to 1.56 mg/l which was higher than the values (0.031-0.017 mg/l) reported by Samir et al. (). Co concentration was varied from 0.005 to 0.019 mg/l which was lower than the values (8.08-3.68 mg/l) reported by Muwanga and Barifaijo (). Zn concentration was varied from 0.167 to 0.427 mg/l, which was higher than the values (0.135-0.111 mg/l) reported, by Muiruri et al. (). The mean concentration (mg/l) of five heavy metals Cu, Co, Fe, Zn and Mn in water samples was 0.058, 0.014, 31.091, 0.234 and 1.560 respectively (Table 2) and according to Pescod () all the metals are within the safe limit for water to be used in irrigation except Fe and Mn. In a study, Gerbrekidan et al. () also found the concentration of heavy metals (Cu, Zn, Fe, Mn, Cr, Cd, Ni, Co and Pb) in the water of Gifel River near Shaba Tannery, Tigray, Northern Ethiopia, were lower than the permissible limit allowed for irrigation water. The higher standard deviation observed for heavy metals Cu, Fe, Zn and Mn in river water which may be due to the ununiform distribution of the respective metals from effluent of various industries. Sharma et al. () also observed a similar trend in the wastewater of Varanasi, India. The data obtained for heavy metals in water from the present study varied more or less regularly with the findings of the other authors (Khan et al. ; Al-Nakshabandi et al. ). This variation might be ascribed to a variety of industries discharging their treated and/or untreated waste water in to the Buriganga river .hence the concentration of heavy metals in industrial effluents depends on the process of product manufacturing and raw materials used in the industries (Sharma et al. ). asafe limit of toxic heavy metals in irrigation water for agricultural purpose (Pescod ). Alam et al. () reported, the average per capita consumption of leafy and non-leafy vegetables is 130 g person−1 day−1 in Bangladesh, whis is considerably less than the recommended amounts of 200 g person−1 day−1 from nutritional point of view (Hasan and Ahmad ).The range and mean concentration of heavy metal (mg/kg dry weight) in edible parts of vegetables grown in the adjacent area of Hazaribag industrial area, Dhaka, Bangladesh are shown in Table 3. In leafy vegetable (Spinach), the Cu concentration ranged from 3.58 to 6.72 mg/kg which was higher than the value reported in Tehran, Iran (0.13 to 0.37 mg/kg) by Delbari and Kulkarni () but lower than the value (15.9-17.4 mg/kg) reported by Arora et al. (). In stem Amaranth, mean Cu concentration was 8.12 mg/kg, which was higher than the value 4.87 mg/kg reported by Jolly et al. (). In radish Cu concentration ranged 3.58 to 4.32 mg/kg which was higher than the value (0.346-0.389 mg/kg) reported by Farooq et al. ().The higher Cu levels in the studied vegetables may be due to the elevated uptake of the heavy metals by plants grown in adjacent area of Hazaribag industrial region of Bangladesh. Concentration of Co was varied from 0.53 to 1.44 mg/kg and found in the order of Stem Amaranth > Spinach > Radish. In the present study, the variation of Co concentration in vegetables was strongly supported by the findings (1.03-1.57 mg/kg) of Naser et al. (). Mean Fe concentration varied from 305 to 1375 mg/kg, which was higher than the concentration (111–378 mg/kg), observed in vegetables by Arora et al. (). Maximum uptake of Fe was found in Stem Amaranth (1375 mg/kg), followed by Spinach (1186 mg/kg) and Radish (305 mg/kg). Ahmad and Goni () also reported a higher Fe concentration in vegetables. The highest concentration of Zn was found in Spinach (78.34 mg/kg) followed by Stem Amaranth (24.34 mg/kg) and Radish (13.57 mg/kg) which agreed with the findings of Liu et al. () in the vegetables from Beijing, China (32.01-69.26 mg/kg) but substantially lower (3.00-171.03 mg/kg) than the vegetables from Titagarh, West Bengla, India (Gupta et al. ); Harare, Zimbabwe (1038–1872 m/kg) (Tandi et al. ). The maximum concentration of Mn was exhibited by Spinach (211.56 mg/kg) followed by Stem Amaranth (29.57 mg/kg) and Radish (<0.63 mg/kg). Concentration of Mn in the studied vegetables was ranged from <0.63-211.56 mg/kg which is higher than the values (11.97-22.09 mg/kg) reported by Ahmad and Goni (), (61.86-156.24 mg/kg) reported by Jan et al. (). However concentration of metals in all the vegetable analysed were within in the safe limit suggested by FAO/WHO, () except Fe and within the word average value (Pendias and Pendias ). The exhibition of spatial and temporal variations of all the heavy metal concentration might be ascribed to the variations in heavy metal sources and the quantity of heavy metals discharged through the effluents and sewage in irrigation water of the study area. asafe limit (joint FAO/WHO food standard programme ). *WAV = World Average Value (Pendias ). In a study Hossain et al. () showed that according to international standard the average per capita consumption of fish is 49 g/person/day but he found 24 g/person/day in Bangladesh. The range and mean concentration of heavy metals (mg/kg dry weight) in fishes are presented in Table 4. In fresh water fish MozambiqueTalipia, concentration of Cu ranged from 2.92 to 3.24 mg/kg which was higher than the value reported in Malaysia (0.27-0.35 mg/kg) (Mokhtar et al. ) but lower than the value (4.03-5.57) reported by Ahmad et al. (). In Tatina, mean Cu concentration was 3.15 mg/kg, which was lower than the value 5.09 mg/kg reported by Ahmad et al. (). In Spotted snakehead mean Cu concentration was 2.84 mg/kg, which was lower than the value 5.27 mg/kg reported Ahmad et al. (). Concentration of Co varied from 8.17 to 9.09 mg/kg and found in the order of Spotted snakehead > Tatina > MozambiqueTalipia. Mean Fe concentration varied from 83.48 to 217.49 mg/kg which was higher than the concentration (0.3-0.35 mg/kg) observed in fishes in Aba River, Nigeria by Ubalua et al. (). Fe concentration (194–235 mg/kg) in Mozambique Talipia was higher than the value reported in Asa River, Ilorin, Nigeria (2.95-8.59 mg/kg) (Eletta et al. ). Concentration of Fe in fish samples were found in the order of MozambiqueTalipia > Tatina > Spotted snakehead. The highest concentration of Zn was found in Tatina (30.12 mg/kg) followed by Spotted snakehead (24.70 mg/kg) and MozambiqueTalipia (24.52 mg/kg). Concentration of Zn (24.52-30.122 mg/kg) in the studied fishes were higher than the value reported in Aba river, Nigeria (1.5-2.5 mg/kg) (Ubalua et al. ), but substantially lower (9.8-1226.40 mg/kg) than the concentrations in fresh water fishes of northern delta lakes, Egypt (Saeed and Shaker ). The maximum concentration of Mn was exhibited by Spotted snakehead (11.75 mg/kg) followed by MozambiqueTalipia (10.35 mg/kg) and Tatina (6.35 mg/kg). Concentration of Mn (6.35-11.75 mg/kg) in fishes were higher than the values (0.18-0.22 mg/kg) reported by Ubalua et al. () but lower than the value reported by Muiruri et al. () in Athi river, Nigeria (147.72-149.7 mg/kg). In the present study Cu, Zn, Fe Concentration in fishes was within the safe limit of WHO except Mn. The exhibition of spatial and temporal variations of all the heavy metal concentration might be ascribed to the variations in heavy metal sources and the quantity of heavy metals discharged through the effluents and sewage in Buriganga River. Although metal concentration depends on the fish’s uptake ability, accumulation ability, fish age, species etc. Metal pollution index (MPI) is suggested to be a reliable and precise method for metal pollution monitoring of wastewater irrigation areas (Ureso et al. ). 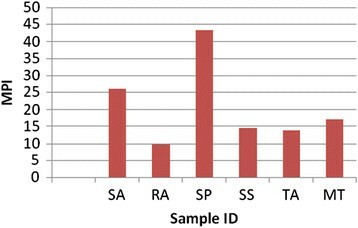 Among different vegetables and fishes metal pollution index (MPI) as shown in Figure 2 followed a decreasing sequence of Spinach > Stem Amaranth > Mozambique Talipia > Spotted snakehead > Tatina > Radish. Leafy vegetables are found to contain higher MPI value than fishes which are may be due to the uptake of higher amount of heavy metal available from polluted soil. This value also agrees with the findings of Singh et al. () of waste water irrigated site in north east Varanasi and the sequences was as Spinach > Lady’s Finger > Tomato > Brinjal > Radish. However higher MPI in Spinach, Stem Amaranth and MozambiqueTalipia suggested that this foodstuff might cause human health risk due to higher accumulation of heavy metal in edible portion. Metal pollution indexes in different foodstuffs analysed. SA=Stem Amaranth; RA=Radish; SP=Spinach; SS= Spotted snakehead; TA= Tatina; MT= Mozambique Talipia. The health risk assessment associated with heavy metal (Cu, Co, Fe, Zn, Mn) in locally grown vegetables and fishes of Buriganga River, estimated exposure and risk index were calculated (Table 5). Health risk index was found bellow one (1) in all varieties of vegetables, and fishes for all the measured elements except Zn. In a study Singh et al. () reported Cu, Zn and Cr were not found to cause any risk to the people by consuming vegetables and cereals grown in the area around Dinapur Sewage treatment plant, India. For Zn it was higher in Stem Amaranth and Spotted Snakehead and hence can pose negative impact on human health those who consumes. On the other hand HRI value lower than 1 for other elements in all varieties of vegetables and fishes may be due to take lower amounts in diet, which consequently decreased the health risk index. Irrigation of agricultural land and fish culturing with treated and untreated wastewater led to the accumulation of heavy metals in vegetables and fishes. Variations in the heavy metal concentrations in the studied vegetables and fishes reflect the difference in uptake capabilities and their further translocation to the edible portion of plants and fishes. The mean concentration of heavy metals in water was lower than the safe limit except Fe and Mn. All the vegetables containing heavy metals lower than recommended tolerable levels proposed by FAO/WHO () except Fe and Co and for fishes it is lower than the permissible level set by WHO () except Mn. The metal pollution index, for all varieties of vegetables and fishes are quite high. Consumption of foodstuff with elevated levels of heavy metals may lead to high level of accumulation in the body causing different disease like thalassemia, dermatitis, brain and kidney damage and cancer. The level of heavy metals (HMs) found in different sources in the present study was compared with the prescribed safe limit provided by WHO () and (), WHO (Pescod ), World average value (2000). In the present study fish and vegetable samples from uncontaminated area were not analysed but concentrations of metal in fish and vegetables found are compared with the results of different similar studies carried out all over the world and also with the safe limit suggested by different organization. Among five heavy metals studied in vegetables and fishes, concentration of Fe was maximum. The MPI (metal pollution index) value for Spinach was very high compared to other vegetables analysed and suggested to take less amount in diet of local people. Health risk index (HIR) for all HMs were less than 1, which is may be due to the high level of allowable oral reference dose of the respective metal and this indicate no risk. The study suggests that as there is high concentration of heavy metals in water, its long term use caused heavy metal contamination leading to health risk of consumers. Thus, regular monitoring of these toxic heavy metals in water, vegetables and fishes is essential to prevent their excessive build up in food chain. Highly appreciate the association and cooperation of the stuff member of Chemistry division, Atomic energy centre, Dhaka and Department of food Engineering & Tea Technology, Shahjalal University of Science and Technology, Sylhet. Sample is collected by FEK. Analysis was carried out by YNJ, FEK, SA and JK. Final manuscript was drafted and edited by YNJ, FEK and GMR. Islam. All authors read and approved the final manuscript.